Geronimo is one of the best routes of the grade in Red Rocks. It has steep, juggy climbing up successive tiers of rock. With face, crack, stemming, and arête climbing, often with incut edges and jugs, Geronimo is a joy to climb. Huge belay ledges and a wild finish up an exposed arête just add to the appeal. The rap route stays right of the climb, reducing tangles. 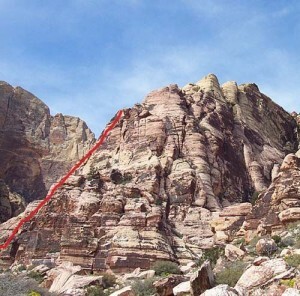 Despite its quality, it is a relatively new climb, and there are many large holds which are somewhat thin and delicate, especially on the first pitch. Which SuperTopo guidebooks include a topo for Geronimo? FA: Bill Cramer, Michelle Cramer, 5/92.